The wreckage of the Manx2 plane on 11 February, 2011. THE AIR ACCIDENT INVESTIGATION Unit will publish its preliminary report into February’s fatal plane crash on Wednesday. Six people – two pilots and four passengers – were killed when a Manx2 plane crashed at Cork Airport on 10 February during heavy fog. Six passengers survived the crash. The AAIU told TheJournal.ie this morning that this week’s report contains factual information regarding the accident, but is just a preliminary report and not the investigation’s final findings. The Department of Transport says the families of the crash victims are being notified ahead of Wednesday’s publication that the report is coming out. The Manx2 airline had launched its Belfast to Cork commuter route six months before the fatal crash and announced two weeks after the crash that it had decided to withdraw the service. The plane crashed during heavy fog on its third landing attempt at around 10am and caught fire after it hit the ground, but was quickly extinguished by emergency crews. Some of the survivors had to be cut from the wreckage and four sustained serious injuries. Email “First report into Cork air crash published this week”. 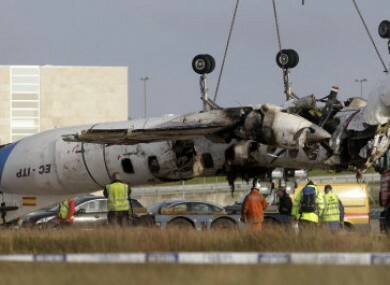 Feedback on “First report into Cork air crash published this week”.